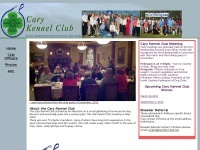 A profile of Carykennelclub.org was found on the social network Facebook. The web server with the IP-address 216.239.138.253 used by Carykennelclub.org is owned by Omnis Network, LLC and is located in Tempe, USA. This web server runs a few other websites, mostly in the english language.